The Lighting Guerrilla international festival is dedicated to the presentation of artistic creations whose main medium of expression is the medium of light. The majority of festival projects is situated in the public space with which we want to stress a different image of the urban spaces and to familiarize the widest audience possible with the contemporary art. The mission of the festival emphasizes the city as a living formation, as a space of creativity that encourages the imagination and dictates a different, dynamic rhythm of life. The eleventh edition of the Lighting Guerrilla festival is focused on the topic of Memories. The content of this edition highlights the meaning and role of memory as manifested both on the level of a individual’s subjective experience and on the broader societal level. Remembering is an inherent human characteristic: by means of remembrance, an individual gives meaning and conceptualizes their past experiences, and at the same time often substantiates its present time and even future. Remembrance helps the man build its own individuality and define its place in the world. The modern man lives surrounded by its stored memory: many tools, such as books and internet, as well as some institutions, serve as storage for the memories of past times and experiences. In spite of that, memory is still something fragile and ephemeral, which is why it’s often subject to manipulation. The program of the festival features a series of projects that explore and discover different aspects of memory and remembrance. The contributing artists draw inspiration from the technical, artistic and cultural heritage or venture on a journey of discovery of their past, with which they often question their identity as well. 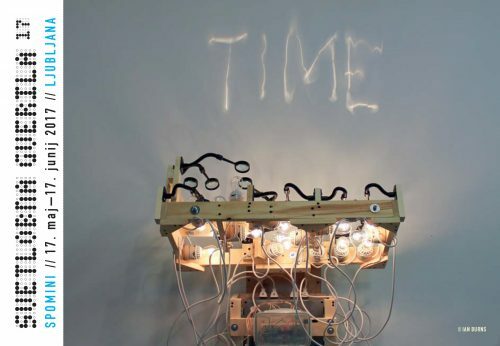 Looking back to the past presupposes a category of time that’s passed, but at the same time it opens up the way into future, elucidating different dimensions of time and space. The category of memory in the contemporary visual language manifests itself as a demanding, but nearly inexhaustible and more than telling subject which is able to arouse both emotions and imagination. This year’s edition consists of two parts: the majority of festival projects will take place as before: in the Vžigalica gallery and in the outdoors around the gallery, while a second series of projects will be displayed in the former Cukrarna Palace building on Ambrožev trg (Ambrož square). We cooperate this year, as well, with the established set of faculties, academies and schools in Ljubljana whose young artists deal with their own verbalization of memory layers. 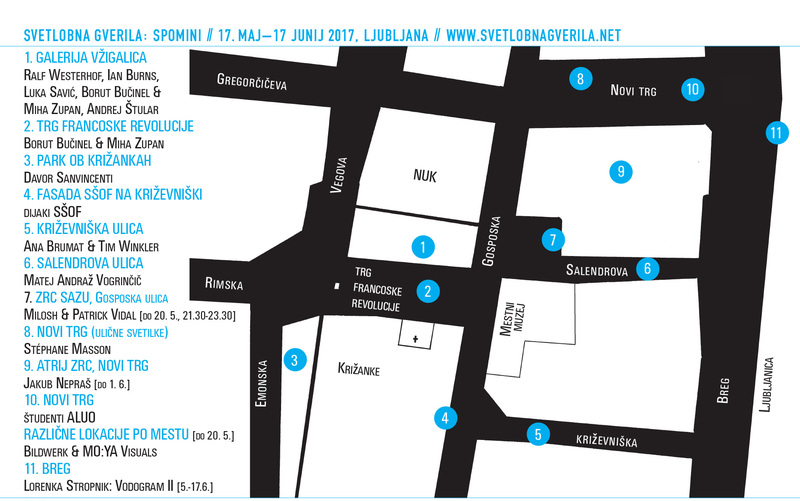 The series of installations in spring in the city centre will be followed by a smaller series of installations in autumn. At the time of the international symposium Lux Evropa the events will be transferred to the Svetlobni park (Lighting park) along Gradaščica in Trnovo, where Aleksandra Stratimirović is preparing a new permanent installation, along with some other installations created by the students of the Faculties of architecture and of electrotechnics in Ljubljana.